Be Okinawa - Special Feature! BEST TRAVEL DEALS IN SINGAPORE! For $148 per pax, you get a 3D2N Flamingo Hotel by the Beach Stay with Breakfast and 2 way Airport Transfer (worth $268). 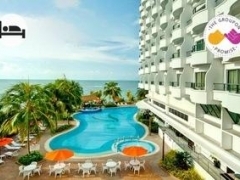 For $248 per pax, you get a 4D3N Flamingo Hotel by the Beach Stay with Breakfast and 2 way Airport Transfer (worth $368). Have feet acclimated to the ground, as soles grace the clean and spacious hotel lobby, furnished with the mandatory check-in counters and welcoming staff. Be greeted by the amazing expanse of blue outside windows, as guests enter the spacious and homely rooms. Spend hours gazing at the view, or if the desire to submerge hits, head down to the pool that overlooks the sea giving imaginative aquatic athletes the sense of conquering the deep blue. With all the breath-holding and kicking, have well-worked out limbs and respiratory tracts rested and rejuvenated with a short wade over to the Beach Bar and order up a refreshing beverage or satisfying snack. The hotel is a mere 15 minutes away from Georgetown and 5 minutes from Batu Ferringhi, providing guests with ample opportunities to traipse along tourist hotspots and Penang Street famous for street food, including cendol and char kway teow. Short drives drop off culturally thirsty tourists at Kek Lok Si temple, Fort Cornwallis, museums, and the Penang Bridge. Conclude productive trotting with relaxing sessions in four-star rooms with pool, gym, spa, or other hotel facilities. Note : All travel products (tour packages, travel deals, cruises packages etc) featured are offered by third party providers. As such, the details such as itineraries, pricing and availability are subjected to changes and they should always be confirmed with the relevant providers.